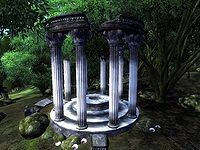 Wayshrines consist of a circle of white columns located in the wilderness. The wayshrines will not show up on your compass and do not have map markers. Each wayshrine is dedicated to one of the Nine Divines. 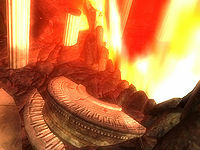 Akatosh and Julianos have four wayshrines, the other divines each have three. Activating the wayshrine will bestow a blessing consisting of healing (restore health 200 pts, restore attributes, cure disease) and a 600-second (10 Minute) duration spell that fortifies one or more attributes. There are a few benefits to be had from visiting each of nine Wayshrines, including being granted a particularly powerful spell once all have been interacted with. See the Notes section for specific information. The Knights of the Nine plug-in includes a quest, Pilgrimage, which involves visiting one of each of the Divines' wayshrines. Additionally, your character's Infamy is cleared and you become a member of the Nine Divines faction. Map of all Wayshrines or view all wayshrines on the Oblivion map. South side of the Gold Road, just east of Skingrad. Directly south of Derelict Mine: map. Buried, but not disabled, by Skingrad's Allies for Bruma Oblivion Gate when the Dagon Shrine quest is completed. Buried and destroyed by Anvil's Allies for Bruma Oblivion Gate when the Dagon Shrine quest is completed. Below are two relatively efficient tours. One mostly on-road and safe, and one very quick making good use of fast traveling to prediscovered points. They may be particularly useful for low level characters who wish to acquire the benefits of a powerful greater power, namely Pilgrim's Grace (see Notes). However, this list is by no means the only possible way to visit all nine wayshrines. Stendarr: From the Imperial Prison Sewer where you begin the game, head south along the coast past Sideways Cave. The Wayshrine should come into view on the other side of the lake. Arkay: Fast Travel to Grateful Pass Stables and head south. The Wayshrine is on top of a hill on your right. Akatosh: Fast Travel to Cheydinhal's west gate, and circuit the city counter-clockwise. The Wayshrine is across a pond on the south wall. Zenithar: Fast Travel to Bay Roan Stables outside Bravil and head north. The Wayshrine should be in plain view to the north. Mara: Fast Travel to Horse Whisperer Stables outside Anvil and head northwest (if you have progressed far enough in the Main Quest, an Oblivion Gate will open on top of this wayshrine and it can't be activated; see notes). Once a wayshrine to a given divine has been visited, a similar but weaker blessing can be acquired by activating that divine's altar in any chapel (fortify +5 pts for 300 sec). Completing the Pilgrimage of the Nine Divines (visiting one wayshrine for each of the nine divines, i.e. nine different wayshrines) will grant you the Greater Power Called Pilgrim's Grace (fortify all attributes +10 points for 300sec). The behavior of all wayshrines is altered if you install the Knights of the Nine official plug-in. Without the plug-in, wayshrines to a given divine can only be used once at a given level of Fame. In other words, to use that divine's wayshrines again, you must increase your fame. However, wayshrines can be used even if your character has Infamy or a bounty. With the plug-in, wayshrines can be used as many times as you want, but only if your character's Infamy is 0 and you are not wearing the Gray Cowl of Nocturnal. With the plug-in, visiting a wayshrine for each of the divines becomes a quest called Pilgrimage and clears your character's Infamy. You will only receive the Pilgrim's Grace greater power if you have zero infamy when you do the pilgrimage; otherwise you will need to redo the entire pilgrimage (without gaining any new infamy) if you want to receive the Pilgrim's Grace power. The particular sample tour above is a little more efficient than that given in Anvil by The Prophet's map. The plug-in also renames all of the "Wayshrines to Tiber Septim" to "Wayshrines to Talos"
Characters with Spell Absorption may absorb the wayshrine's spell. This is one way for characters with the Atronach birthsign to restore their magicka. Two Oblivion Gates appear directly on top of wayshrines. One gate appears on top of the wayshrine of Kynareth just east of Skingrad (shown in the image); this wayshrine becomes half-buried, but can still be activated. Another gate appears on top of the wayshrine of Mara north of Anvil, and completely destroys the wayshrine. In both cases, the Oblivion Gates are fixed gates that will always appear as soon as the Dagon Shrine quest is completed. Two additional wayshrines can be found, but neither of these can be activated. One is west of Chorrol (map), the other is far east of Bravil (map). Horses can also receive blessings at wayshrines. For more information, see this page. Esta página foi modificada pela última vez à(s) 07h56min de 1 de junho de 2015.